We’d love your help. 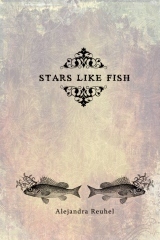 Let us know what’s wrong with this preview of Stars Like Fish by Alejandra Reuhel. A girl with an imaginary friend who only speaks in rhyme; a man haunted by nostalgia for a world he never knew. Stars Like Fish paints geographical, emotional and psychological landscapes of a future past through poetic prose and allegory. It is a collection of short stories, poems, poetic prose and photography. To ask other readers questions about Stars Like Fish, please sign up. I read this while having some insomnia. It's funny how Ms Reuhel let me borrow her dreams while mine didn't come with me during my travels. I hope she keeps dreaming. I got this book as a gift. Some of the stories/poems were pretty good, but I found myself getting bored. It's not one to read straight through. It's one for when you have ten minutes and want to read a couple short stories. Most of the photography was pretty interesting though.